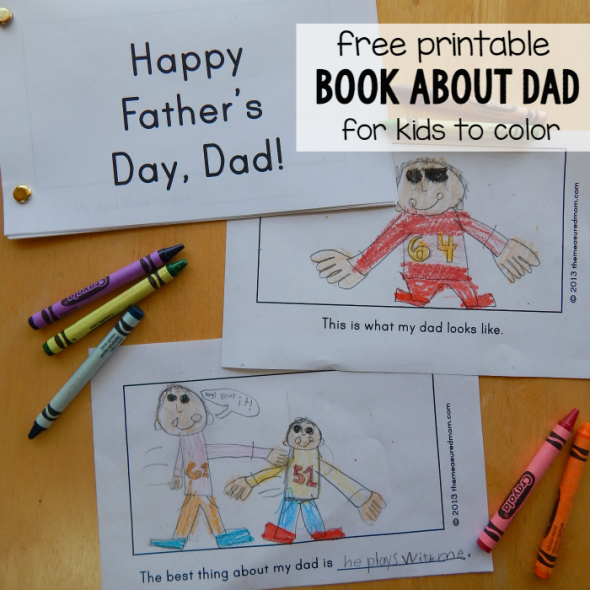 Here’s a homemade Father’s Day gift idea — great for toddlers through early grade schoolers. My Six (just finishing kindergarten) did the whole thing by herself in one sitting. She loved it! My Four wanted to write all the words himself — and was very concerned that he was spelling the words correctly. I kept repeating, “You’re spelling it right for today. You’re spelling all the sounds you hear, and that’s just right!” I sat beside him and helped him stretch the words out. Occasionally I supplied a digraph: “th” or “sh.” The rest of the spelling is his. This is so important for young writers. If you give them all the spellings, they will need you next to them for every word – it can stifle creativity and independence. My general thought is that if supplying the spelling will not help the child for the future, then he’s too young to be given spellings. My just-turned-Three does not write any letters on his own yet, so I filled in the lines for him. He is just starting to do a little drawing. Most of his pages are scribbling, but I shared a few below in which he attempted some drawing. My 16-month-old was thrilled to sit on my lap, take the caps off the markers, and scribble. Since he typically bites the tips off markers, they are kept well out of his reach! Only my oldest was able to complete the book in one sitting. We returned to it another day for each of the boys. Then I punched holes and attached ribbon to each book. I’ve also punched holes and used brass fasteners (see main image). Here’s a preview of each page — highlighting different pages from each child’s book. If you like this idea you can make your own or use ours. Just print the pages on regular paper and cut across the center – then pick and choose which pages you’d like to include. Get a “Daddy” version HERE. Get a “Papa” version HERE. Get a “Grandpa” version HERE. Get a version with blank lines for the name HERE. This is very cute! Pinning it! Super cute idea. Love it. Thanks for linking up at Artsy Play Wednesday. I pinned it to our group board. What a great idea for a Father’s Day gift! Thanks for stopping by, Trisha! Thanks for this great idea! We will definitely be trying it this Father’s Day! Hi, Erin! I hope it’s a hit! How cute are these – Thanks for sharing!! Thanks so much for checking them out, Candace! these are fun to make.. Dad will be thrilled. Thanks for checking it out, Molley! Visiting from Teach Me Tuesday linky…..
How cute! I’ve been needing some ideas for the kids to make for Father’s Day. Thanks for the printable! You’re welcome, Cyndi – thanks for checking it out! Thank you for this! 🙂 I’ve seen other ones on the web, but my girls are still pretty young (4 & 2) so this one is PERFECT! 🙂 I just finished printing them! God bless! I’m so glad this works out for your little ones! Thanks for popping by, Catie! I love this. However, my girls call my husband “Papa”. Is there any way you could make a variation where the spaces are empty for the Dad or Daddy spots? Just a thought. That would also allow for those of us who would like to use it for grandfathers. Thanks so much for the feature, Charlene! Thank you so much for the printable! 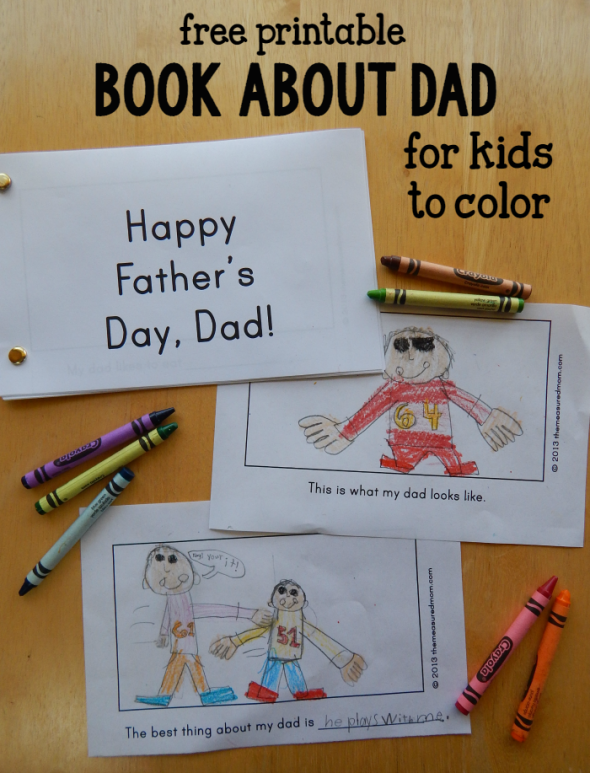 I was looking for a story book idea for a Father’s Day play date I’m hosting later this week and this is perfect! I can’t wait for all the kids to enjoy making their books! Yay! Thanks so much for commenting, Tabitha! I love to hear that people can use my printables. Hi, I saw this featured over at I Can Teach My Child and had to come over and see. This is great, my children will love it. Just wanted to say, I also have children at about the same ages as yours. My Tabitha is 6, Amelia is going to turn 5 this month, Hannah just turned 3 a couple of months ago, and the little one is almost 16 mths old! I am going to have to come back and check out your blog a bit more. I know I’ve visited before, but it is hard to keep up with everyone I follow. If you haven’t stopped by Tots and Me recently I’d love for you to stop by. We are in the middle of our Butterfly unit and just finished a Butterfly Life Cycle mobile. Thanks so much for commenting! I checked out your blog – wow, what a busy family you have! That’s funny how close in age our kids are, especially as our youngest is just about 17 months! But of course I don’t have a crew of older kids too :). Hope you stop by again! I’ll enjoy hearing what you’re up to over at your house. This is wonderful–I can’t wait to use it! I will be featuring this at Teach Me Tuesday at Preschool Powol Packets this week–thanks so much for linking it up! Thank you so much for the feature, Carla! What a sweet idea for Father’s Day! 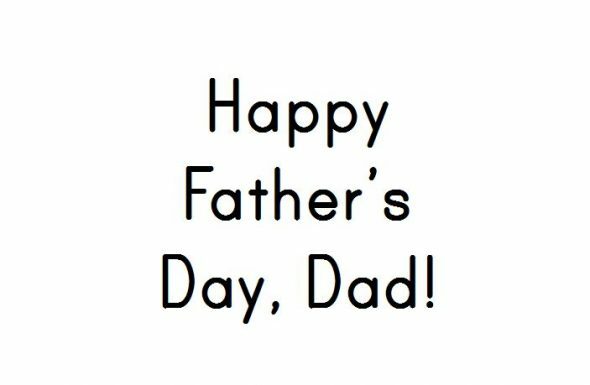 Thanks so much for sharing your free printable! I featured your post as the Free Printable of the Day at the Living Montessori Now Facebook page https://www.facebook.com/LivingMontessoriNow (and on Pinterest). Ive been looking for ideas-Thanks! I hope you can use it, Tess! Thanks for stopping by! What a great gift!! Thank you for sharing on Sharing Saturday!! Thanks for including us in your round up, Emma! Thank you so much for making this available! I’m definitely going to do this with my kids. I tried printing, but it doesn’t print the words, just blocks? It should definitely print the words, Lisa. What browser are you using? If you’re using Internet Explorer or Firefox you might have trouble. I have my best success with Google Chrome. thank you for the fix ( wink wink) Girls are working on their books right now!!! Thank you so much for this! We will be using it at our church’s summer fun craft time! You’re very welcome, Bonnie – I hope you had a chance to use it! Thanks for the great idea! My 4.5 will definitely love this–and maybe my 2 will contribute a little! I don’t have something like that, Margaret, but it’s something to think about for the future! This is perfect! My daughter loves to make books and is so excited to give this to her daddy. Thank you for sharing! Yay – I’m glad you could use it, Robin! I love these! Do you have anything for Grandparents day or Mother’s Day? I’d love to do one for the Grandmothers. These were a huge hit for the Grandpas!!! That’s a great idea, Melody! It’s not on my to do list yet, but I’ll put it down for a future project. Hi Anna! Any further consideration on doing these for Mother’s Day? 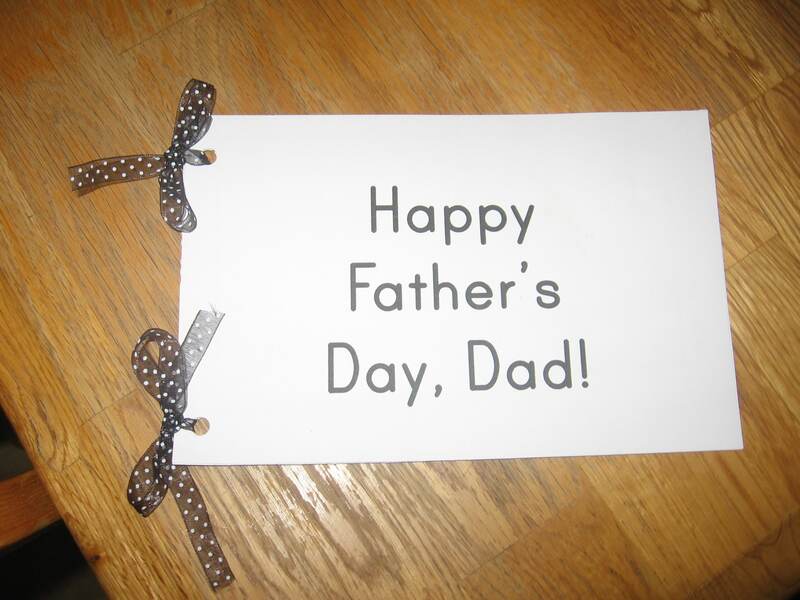 My mother adored the one my daughter did for my dad last Father’s Day. Thanks for considering! What browser are you using, Cassandra? And what happens when you right click and choose “save as”? Hi, I couldn’t get it to open for some reason. Is there any way you could email me the pdf? Thanks!